During WWII, thousands of British soldiers were discharged for injuries sustained in combat. Many received severe scars covering their entire face or extremities. 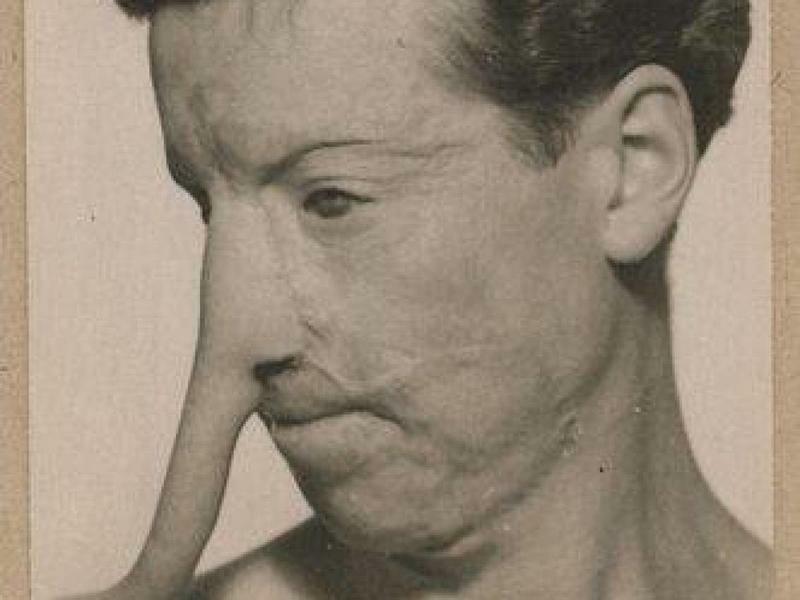 One plastic surgeon was determined to devise revolutionary surgical methods, his name was Sir Archibald McIndoe. He just needed willing subjects to experiment on, and thus the "Guinea Pig Club" was formed. The club was formed to treat not only physical wounds, but the mental anguish that came with them. Desperate servicemen with severe injuries and scars were the first to volunteer. 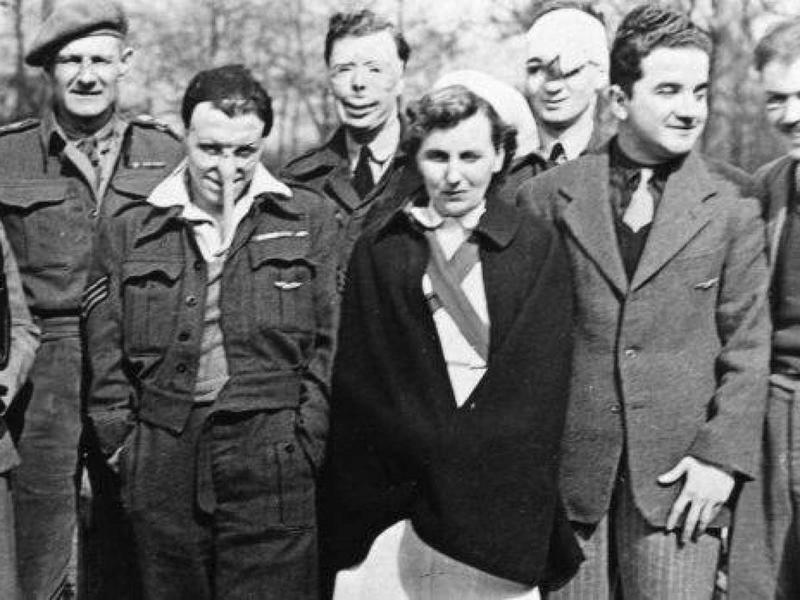 Before joining the club, each veteran had to let McIndoe perform two surgeries on them. This ensured a steady stream of fresh recruits to practice on. 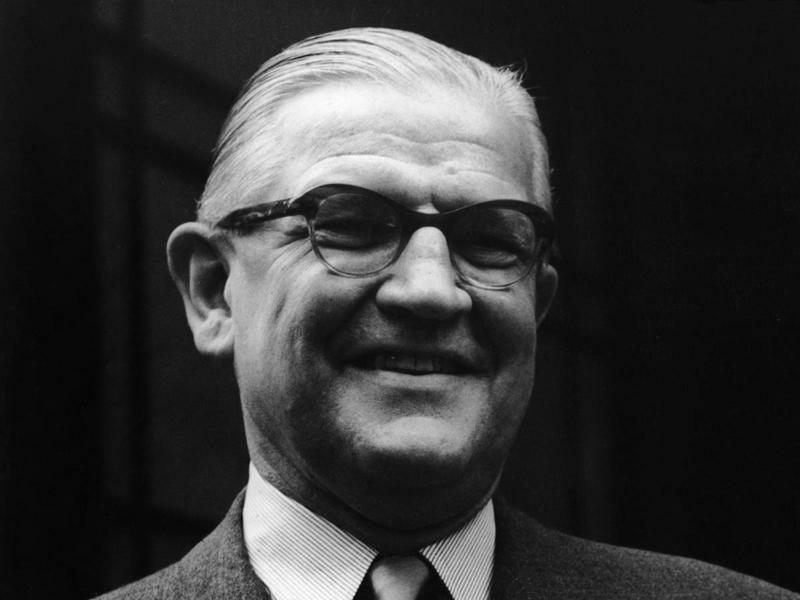 Plastic surgeries at the time relied largely on trial and error, so McIndoe required plenty of patients to test out his various theories. His methods for rebuilding faces were incredibly effective, if not utterly bizarre. Square patches of skin from patient's thighs would be sliced off until only one side was still connected. The skin flap would then be rolled upon itself like a tarp, stitched shut, then attached at the other end to the patient's arm or shoulder. 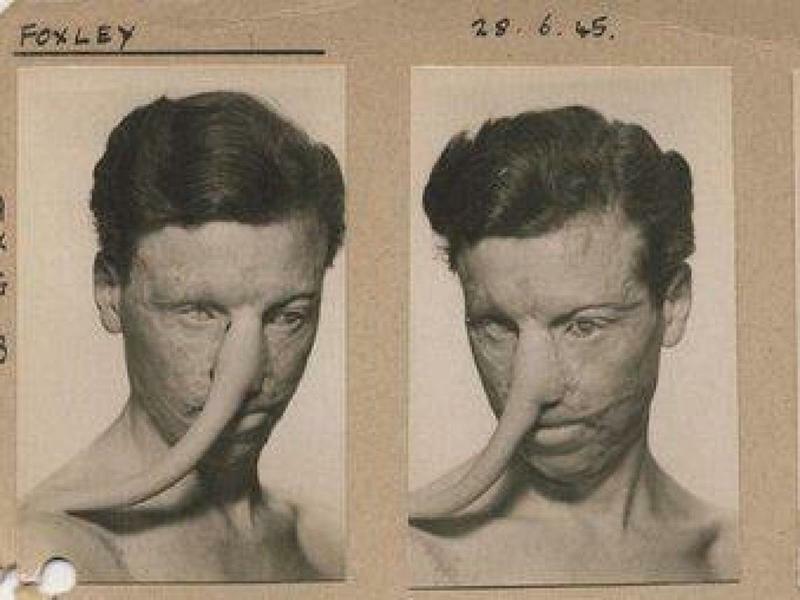 After the tube-like appendage bonded to its new home, McIndoe would detach the end connected to the thigh and graft it to the injured area on the patient's face. Until the new attachment bonded, the skin couldn't be used for reconstruction. In the meantime, club members walked around for days with weird looking skin trunks bridging their face and arm. 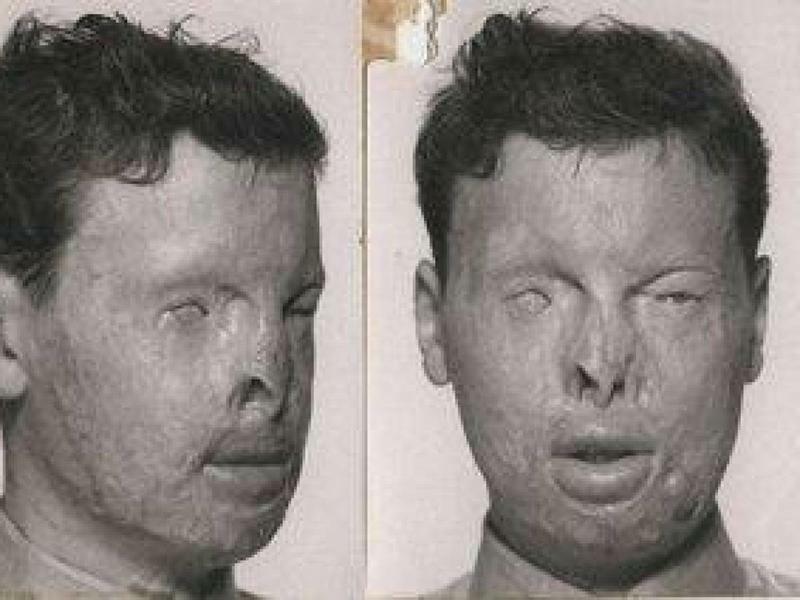 One man named Bill Foxley, underwent 29 surgeries to counteract major burns on around his eyes. The operations were a resounding success, fixing nearly everything aside from a moderate loss of vision and an inability to smile. He blended into society afterward, and married a nurse from the hospital. Another patient, Sandy Saunders, was so moved by the results of his surgery that he became a doctor after the war. His days at the Guinea Pig Club were spent observing McIndoe's work firsthand in preparation. The club maintained a jubilant atmosphere that kept spirits high among its odd looking patrons, unlike many hospitals of the era. Showgirls were also ushered in to talk and flirt with them in a bid to reclaim lost confidence. Tending to a patient's mental well-being was seen as superfluous in those days, but McIndoe took it very seriously. He'd organize field trips around Grinstead to the cinema or local plays where they'd be welcomed in amicably. This outside interaction led to many of the patients marrying girls from around the town. While the club's friendly atmosphere was anything but a facade, ulterior motives still persisted. 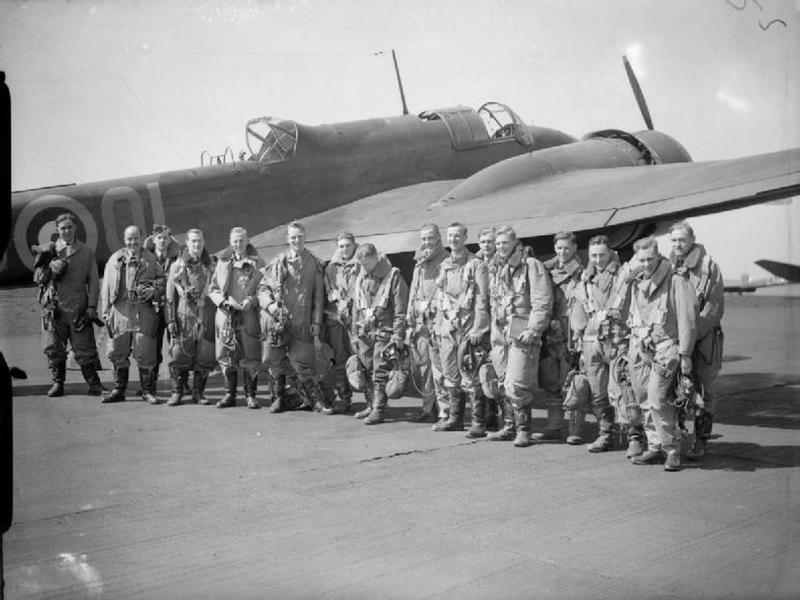 The injured fighter pilots were the product of immense training, and the Royal Air Force was looking for a return on their investment. They wanted their men to reenlist after recovery, and thought a morale boost was the best way to achieve this. After years of hosting the Guinea Pig Club, Grinstead was christened “The Town That Never Stared.” Years following the war came with the occasional reunion between the 649 club members. The number has since dwindled to 39, and reunions ceased in 2007 since the youngest member was 82. Still, the spirit lives on as medical practices have since grown to embrace compassion and acceptance as key components of the recovery process.